I've been invited to the Writer's Tent at Createfest, a family-friendly, one-day, FREE event that runs May 14th from 12:00 PM - 7:00 PM. I will have a mic and a question for you: What is one fictional character, place, or invention you would like to see made real? The answers will be compiled and shared on the Pendragon Variety Network. So come say hello, get your signed copy, and browse the works of other local artists and writers! 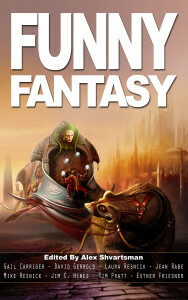 Funny Fantasy, edited by Alex Shvartsman, is an excellent collection of humorous fantasy tales with a wide range of subgenre and tone, from irreverent hyperbole to clever social commentary. “Dave the Mighty Steel-Thewed Avenger” by Laura Resnick opens up the anthology with over-the-top, ostentatious fantasy trappings that summarize down to a talking raccoon giving a disbelieving drunk college student a magic weapon. What could possibly go wrong? Many of the other stories are also quite glib, including Mike Resnick's "A Very Special Girl," wherein a zombie thug falls in love, demonstrating that beauty is in the eye of the beholder. To balance out the collection's tone, “Fairy Debt” by Gail Carriger is a sweet story wherein fairy Cups can bake amazing banana cupcakes. Retold folk tales and blatantly inverted tropes provide the backbone of Funny Fantasy. In “Crumbs” by Esther Friesner, Hansel's son becomes a paladin for an obnoxious king who sends him deep into the evil woods, where he finds that Hansel and Gretel's version of the story, and his view of witches in general, is patently erroneous. In “The Blue Corpse Corps” by Jim C. Hines, goblins scramble to let zombies bite them so that they can gain near-invincible powers. For those who are tired of faerie realm stories, “The Best Little Cleaning Robot in All of Faerie” by Susan Jane Bigelow mixes in a little space opera and ends on a completely irreverent note. On the social commentary side, “Another End of the Empire” by Tim Pratt follows a tyrant king determined to undermine the prophecy of his downfall by creating the Village of Progress. A few stories take on sexism directly; “A Fish Story” by Sarah Totton shows just how inappropriate an unwanted suitor's attentions can be, and in “The Queens Reason” by Richard Parks, the young man who has come to save the queen from her insanity is not at all what he appears to be. All-in-all, Funny Fantasy is a solid anthology with plenty of laughs. Are you still reading this? What are you waiting for? Pick up Funny Fantasy on [ Amazon ] and check out Alex Shvartsman's website, AlexShvartsman.com - he writes plenty of funny fiction himself and edits great anthologies, including the Unidentified Funny Objects series.